Erin Green is a staff writer covering BIM and civil engineering topics. She contributed this article to http://www.engineering.com/ and Insulation Outlook. Augmented Reality (AR) is a hot topic—and there is a good reason for that. The technology has the potential to revolutionize all kinds of fields, from employee training to machine maintenance and even the way we build our cities. Yet despite all the neat headsets being released to the market, AR is not a perfect technology. There are still many things that need improvement. We sat down with Stéphane Côté, research director at building information modeling (BIM) software developer Bentley Systems’ Applied Research group, to talk about some of these issues keeping AR out of our construction sites. The research group at Bentley has been working on AR for quite some time—9 years, to be precise—and it certainly has a unique way of going about it. 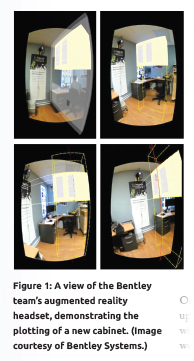 There was not much available in terms of AR headsets at that time, so the team used 2 webcams, an orientation sensor, a pair of goggles, and some duct tape to create its own AR system. This MacGyvered system enabled the team to understand the advantages of AR in construction as well as some of the problems with it. With so many affordable headsets reaching the market nowadays, it is important to look at AR and consider what it can and cannot do for architecture, engineering, and construction (AEC). AR has oodles of potential uses in the AEC industry. It can be used to demonstrate potential design options in the context of the real world or to supplant the need for construction workers to measure every little detail prior to installation. These “magic glasses,” as Côté called them, could be serious time-savers. However, making mistakes in construction can be devastatingly expensive and if your information is not flawlessly accurate, you could be signing yourself up for a lot of trouble. Côté used the example of a system that lets the user “see” through surfaces to locate infrastructure features like underground pipes. Until a solution is found, inaccurate information will certainly play a role in preventing mass adoption of AR on construction sites—and that brings up another issue. Once we get information accuracy up to snuff, there is something else we will need to consider: dynamic work environments. No active construction site sits inert. They are places of constant movement, with workers buzzing around like bees trying to get the job finished as efficiently as possible. AR technology at this point is unfortunately best suited to static environments. There has been some progress on this front, especially in the context of testing AR in gaming environments, but it has not yet reached a level of reliability for high-stakes construction sites. Another aspect of AR systems that still requires more research is headset design. If you look at the HoloLens, for example, you see a large set of goggles that obscure part of your face and peripheral vision. “We would like AR to improve safety on building sites and not decrease it, so somehow these augmentations will have to integrate well with the type of work being done and the type of equipment and type of clothes being worn so that it’s useful and not a threat,” said Côté. There has been some work in this direction, including designs like AR contact lenses for bionic vision, but these designs will need to become fully realized before augmented reality is accepted on job sites. For more information about Bentley Systems’ efforts to bring augmented reality to AEC, check out Côté’s blog at http://tinyurl.com/hbzqget. This article was published in the July 2016 issue of Insulation Outlook magazine. Copyright © 2016 National Insulation Association. All rights reserved. The contents of this website and Insulation Outlook magazine may not be reproduced in any means, in whole or in part, without the prior written permission of the publisher and NIA. Any unauthorized duplication is strictly prohibited and would violate NIA’s copyright and may violate other copyright agreements that NIA has with authors and partners. Contact publisher@insulation.org to reprint or reproduce this content.